First, before we begin with Olberman’s statement, we need a little back story. 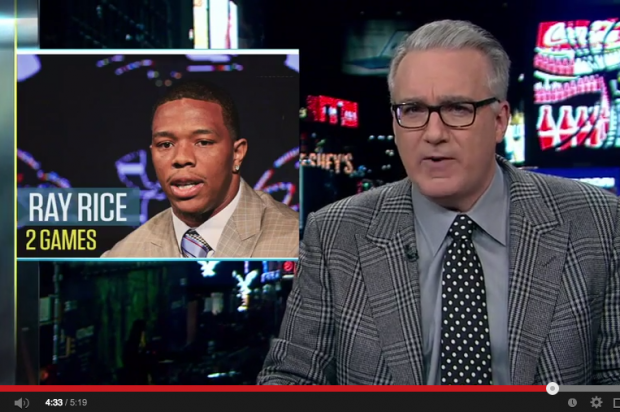 Ray Rice was (he was fired on Monday) a player for the Baltimore Ravens. He was indicted for domestic abuse. On February 15, Rice and his then fiancée got into a heated argument and he knocked her out cold in the elevator. The tape that was (allegedly seen) by the NFL was of Rice dragging his unconscious fiancée out of the elevator to the hotel room. The couple married on March 28th, one month after his indictment. He avoided jail time by going to a pretrial diversionary program. What was surprising to most was the NFL’s reaction to this incident. Roger Goodell, NFL commissioner, gave Rice a 2 game suspension. This suspension was shorter than other players had received for marijuana use, and other crimes that do not involve bodily injury. Goodell has later stated that he “didn’t get it right,” and has imposed tougher punishments for domestic violence. This week a new video has surfaced. TMZ, our friendly, neighborhood paparazzi, found the actual video from inside the elevator where we see Rice deliver a knock-out punch to his fiancée. For those of you who want to see it, here is the link to the article. TMZ included the raw footage and a cleaned up version. The NFL states that they never saw this second video and that this video changes everything. Rice was fired on Monday from the Baltimore Ravens, and both Goodell and the Ravens’ organization are receiving sharp criticism from current and former players and new commentators. “We begin tonight with the unavoidable and simple truth that intentionally, or by neglect, the Atlantic County, New Jersey district attorney’s office, the Baltimore Ravens, the National Football League, and commissioner Roger Goodell have conducted a cover-up of Ray Rice’s assault on his then fiancée on February 15th. How could this have happened? How could the NFL have thought that a 2 game suspension was enough? How could we have thought that this incident was just a “bad night,” as the Ravens head coach had said? The original video released shows Rice dragging his unconscious fiancée out of an elevator. What other conclusion could have been made about what happened to her? And yet Rice is an amazing running back and I think the organization was wanting to do everything in their power to keep him. But here is the thing: we all know athletes are role models, and men. And because they choose to be role models, because they choose to be professional athletes their choices are seen differently. Rice’s actions are wrong and inexcusable, but so were the Raven’s actions, and so were Roger Goodell’s actions. Everyone needs to be held accountable for what they did. Is Condoleezza Rice a good choice for a Republican VP?